Alternative splicing is an essential mechanism for increasing transcriptome and proteome diversity in eukaryotes. Particularly in multicellular eukaryotes, this mechanism is involved in the regulation of developmental and physiological processes like growth, differentiation and signal transduction. Here we report the genome-wide analysis of alternative splicing in the multicellular green alga Volvox carteri. The bioinformatic analysis of 132,038 expressed sequence tags (ESTs) identified 580 alternative splicing events in a total of 426 genes. The predominant type of alternative splicing in Volvox is intron retention (46.5%) followed by alternative 5′ (17.9%) and 3′ (21.9%) splice sites and exon skipping (9.5%). Our analysis shows that in Volvox at least ~2.9% of the intron-containing genes are subject to alternative splicing. Considering the total number of sequenced ESTs, the Volvox genome seems to provide more favorable conditions (e.g., regarding length and GC content of introns) for the occurrence of alternative splicing than the genome of its close unicellular relative Chlamydomonas. Moreover, many randomly chosen alternatively spliced genes of Volvox do not show alternative splicing in Chlamydomonas. Since the Volvox genome contains about the same number of protein-coding genes as the Chlamydomonas genome (~14,500 protein-coding genes), we assumed that alternative splicing may play a key role in generation of genomic diversity, which is required to evolve from a simple one-cell ancestor to a multicellular organism with differentiated cell types (Mol Biol Evol 31:1402-1413, 2014). To confirm the alternative splicing events identified by bioinformatic analysis, several genes with different types of alternatively splicing have been selected followed by experimental verification of the predicted splice variants by RT-PCR. The results show that our approach for prediction of alternative splicing events in Volvox was accurate and reliable. Moreover, quantitative real-time RT-PCR appears to be useful in Volvox for analyses of relationships between the appearance of specific alternative splicing variants and different kinds of physiological, metabolic and developmental processes as well as responses to environmental changes. Alternative splicing of precursor messenger RNA (pre-mRNA) is an important post-transcriptional regulatory mechanism that enhances the transcriptome plasticity and proteome diversity. Alternative splicing produces multiple transcripts from a single gene by varying the selection of the include/exclude regions. The different splicing products of a single gene produce different protein isoforms with different functions and effects [1–10]. Alternative splicing can also introduce premature stop codons, which cause down-regulation of expression of the corresponding gene by nonsense-mediated decay (NMD) of mRNA . The five basic types of alternative splicing are as follows: 1) exon skipping, if an exon is either included in or excluded from the pre-mRNA; 2) intron retention, when an intron is either retained or excised from the pre-mRNA; 3) alternative 5′ splice sites and 4) alternative 3′ splices site allow the extension or shortening of a particular exon, depending on the use of a proximal or distal 5′ and 3′ splice site, respectively; 5) mutually exclusive exons occur when two or more adjacent cassette exons are spliced such that only one of them is included at a time in the mRNA [2, 5, 12]. Alternative splicing events are not rare, but quite common in eukaryotes. In human, ~95% of all intron-containing genes are alternatively spliced, ~60% in Drosophila melanogaster, ~25% in Caenorhabditis elegans and ~61% in Arabidopsis thaliana (hereafter Arabidopsis) [13–21]. The real percentages might even be higher than reported, because they correlate with the number of sequenced ESTs. An increased number of sequenced ESTs frequently reveal additional alternative splicing events because more and more rare splicing variants from genes with low expression become sequenced. For Arabidopsis the reported percentage of alternatively spliced genes increased dramatically within a decade: it was 1.2% in 2003 , 11.6% in 2004 , more than 30% in 2006 , 42% in 2010  and 61% in 2012 . In Arabidopsis, the most frequent alternative splicing variant is intron retention (~40%) [18, 19]. Most alternative splicing events in Arabidopsis, i.e. 78.4%, occur in the coding region and about 50% of which produce a premature termination codon that is a potential target for NMD [5, 25]. In addition, 15.2% of all alternative splicing events occur in the 5′-untranslated region (UTR) and 6.4% in the 3′ UTR . In humans, the allocation is quite different from Arabidopsis: the most common alternative splicing variant is exon skipping (42-58%), whereas intron retention forms only a small fraction (5-9%) of all alternative splicing events [5, 26]. Two main factors that affect the occurrence of alternative splicing are intron lengths and the nucleotide composition of the introns . Intronic nucleotide composition has been shown to affect splicing efficiency of intron retention [10, 28–30]. Compared to the average length of human introns, which is 3365 bp, Arabidopsis introns are much shorter and show an average length of only 170 bp [31, 32]. In human introns the AT content is only 51.9% , while plant introns show a high AT content: in Arabidopsis it is 67% and in rice it is 73% [5, 33, 34]. Moreover, the nucleotide composition of plant introns is also different between dicots and monocots. In rice, for example, the introns are longer and have a higher GC content than in Arabidopsis, which might be an indication for a different impact of alternative splicing in these organisms [27, 35–37]. Alternative splicing produces protein isoforms that differ from each other with regard to localization, enzymatic activity, signaling effects and protein stability [2–5]. In plants, alternative splicing was shown to be involved in signal transduction and timing of flowering . Alternative splicing can also act as a gene regulatory mechanism during developmental processes or in response to environmental conditions [2–6, 8, 9]. Various biotic and abiotic stress factors are known to influence alternative splicing [4, 6, 38–41]. Relevant abiotic stress factors are heavy metals, cold and heat. For example, the splicing of polyubiquitin and hsp70 mRNAs in maize is affected by a heat shock [42, 43]. Biotic stress factors that influence alternative splicing are viral and bacterial pathogens [5, 44, 45]. Plants even seem to regulate their transcriptome post-transcriptionally in response to quickly changing environmental conditions and pathogen attacks by using alternative splicing mechanisms [39, 46, 47]. Like in higher plants and animals, alternative splicing also is a common mechanism for increasing transcriptome diversity in much simpler organisms like algae. Previous studies in volvocine green algae, which include unicellular forms like Chlamydomonas reinhardtii (hereafter Chlamydomonas) to colonial and multicellular forms with increasing complexity like Volvox carteri (hereafter Volvox), revealed a number of genes that undergo alternative splicing. Examples include algal-CAM and RBR1/mat3[49, 50] in Volvox and Cop1 and CGE1 in Chlamydomonas. A recent study about alternative splicing in Chlamydomonas indicates that about 3% of all genes in Chlamydomonas undergo alternative splicing , which is much lower than recent reports from higher plants (e.g., 61% in Arabidopsis; based on the analysis of 116 million paired-end RNA-seq reads of a normalized cDNA library) [18, 19]. The analysis of a large EST dataset of Chlamydomonas resulted in 498 EST clusters that show 611 alternative splicing events . The results indicated that 11.6% of the alternative splicing events in Chlamydomonas (based on the analysis of 252,484 ESTs) are alternative 5′ splice sites, 25.8% are alternative 3′ splice sites, 0.7% show both alternative 5′ and 3′ splice sites and 11.9% show exon skipping. Like in Arabidopsis, the most frequent alternative splicing event in Chlamydomonas is intron retention, which accounts for 50% of all events . Based on molecular-phylogenetic studies, Volvox and Chlamydomonas probably diverged ~ 200 million years ago from a common unicellular ancestor . On the time-scales of evolution, the transition from unicellular to multicellular life in Volvox is thus a quite recent occurrence when compared to other shifts to multicellularity. Other transitions to multicellularity, such as the ones that gave rise to plants and animals, occurred deep in the past, approaching a billion years ago [55, 56]. The evolution of multicellular live in volvocine algae required several developmental traits including asymmetric cell division and embryonic morphogenesis. Most probably, the first multicellular volvocine algae were just small colonial organisms (like Gonium) without differentiated cells. Later size, cell number and overall complexity increased and a tendency to cell differentiation evolved (like in Eudorina and Pleodorina). Finally, even a complete division of labor between somatic cells and germ cells developed (like in Volvox) . Comparative analyses of the Volvox and Chlamydomonas genomes revealed that the overall sequence divergence between these organisms is comparable to that between human and chicken (which diverged ~310 million years ago) and Arabidopsis and poplar (which diverged ~110 million years ago). Moreover, despite conserved synteny between the genomes, Volvox and Chlamyomdonas show higher rates of genomic rearrangement than vertebrates and eudicots do . The nuclear genome of Chlamydomonas is 118 Mbp in size and that of its multicellular relative Volvox is composed of 138 Mbp. The larger genome of Volvox (~17% larger) is attributed to its higher content of transposons and repetitive DNA [58, 59] because both species have almost identical protein-coding potentials, i.e., 14,516 and 14,520 protein-coding genes in Chlamydomonas and Volvox, respectively. Only a few gene families, i.e., the pherophorin genes, the VMP genes (Volvox matrix metalloproteases) and the cyclin-D related genes have more members in Volvox than in Chlamydomonas. This suggests that the transition from a unicellular, Chlamydomonas-like ancestor to multicellular Volvox did not take major changes in gene content [58, 60] but mainly alterations in the mechanisms of genetic regulation. Thus, development of organismal complexity might be mainly caused by evolutionary innovations of pre-existing proteins (e.g., transcription factors) and their binding sites, inventions of noncoding RNAs, innovations in the mechanism of alternative splicing and increase of alternative splicing events [58, 61–64]. Alternative splicing can produce different protein isoforms from a single gene, which has produced only a single protein in an ancestor; in this way, diversity increases. Together with differences in selection pressures within a population, appearance or changes in alternative splicing can lead to speciation. Interestingly, two key factors that affect the splicing mechanism are different between the genomes of Chlamydomonas and Volvox: the intron length and the nucleotide composition. With an average length of 491 bp, the introns of Volvox are clearly larger than Chlamydomonas introns, which span only 371 bp on average  (Additional file 1: Table S1). Bioinformatic analyses showed that exons flanked by longer introns are more frequently subject to alternative splicing events than exons flanked by short introns [65, 66]. Furthermore, the genome of Volvox shows a lower GC content (56%) than the genome of Chlamydomonas (64%) [58, 59], which might cause differences between the two species in alternative splicing [27, 35]. Based on these two key differences between both genomes, a detailed investigation of alternative splicing may reveal new insights into the gene regulation mechanisms that have been required for the evolutionary transition from unicellular Chlamydomonas to multicellular Volvox, while the number of genes remained about the same during this transition. Here we report the analysis of alternative splicing in the multicellular green alga Volvox. After bioinformatic analysis of 132,038 ESTs, we identified 580 alternative splicing events corresponding to 426 genes. We show the distribution of the different types of alternative splicing events in Volvox and compare it with other species. To confirm our bioinformatic results, several alternatively spliced genes have been selected as representatives for experimental verification. After confirmation of alternative splicing variants by reverse transcription polymerase chain reaction (RT-PCR), the relative expression level of each splice variant was determined using quantitative real-time RT-PCR. Our results indicate that alternative splicing is a widespread process for generating protein isoform diversity in Volvox, which suggests an important role of alternative splicing for expansion of organismal complexity during evolution of multicellularity and cell differentiation in volvocine algae. The genome-wide analysis of alternative splicing in Volvox and its comparison with both a closely related unicellular alga (Chlamydomonas) and a more distantly related higher plant (Arabidopsis) required both extensive genomic and EST sequence data. These data were obtained from the corresponding databases of Volvox, Chlamydomonas and Arabidopsis (see Methods). The data sets of the three species were treated in the same way to provide the necessary comparability. All available ESTs of the three species were aligned to the corresponding genomic contigs and genome sequences using BLAT, a BLAST-like alignment tool . Only the best alignment was used to avoid double counting of paralogs. EST sequences with less than 95% identity to any sequence in the corresponding genome were removed from further analysis. The resulting alignments were then clustered by their genomic location. In this process a cluster arises from the set of all ESTs, which overlap at a given genomic location. Subsequently, the splice site consensus sequences were identified for all splicing events. The vast majority of introns in protein-coding genes of Volvox and of any other previously investigated eukaryote are canonical, which means that they have a GT dinucleotide at their 5′ end and an AG dinucleotide their 3′ end . Only about 1-2% of the introns are non-canonical. To compensate for artefacts that may occur in further analysis, we omitted alternative splicing events that involved introns with non-canonical splice site dinucleotides (i.e., not GT/AG). Then, alternative splicing graphs of potential splice variants were constructed for each cluster in the three genomes. An intron was constructed in a given splice graph when there was EST evidence of a transcript with canonical splice sites. 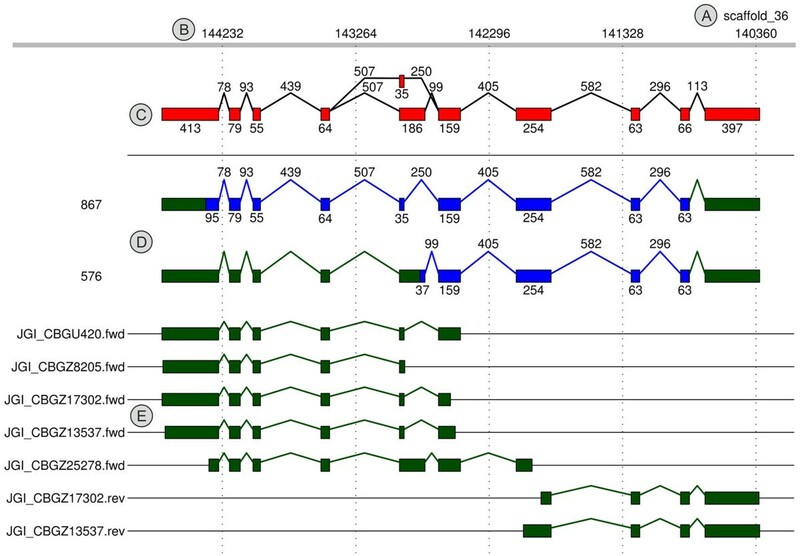 A representative sample of one alternative splicing locus out of 6,925 loci in Volvox is shown in Figure 1. At the 6,925 loci we identified 31,885 exons. This gives an average of 4.6 exons per locus. Representative sample of one alternative splicing locus out of 6925 loci in Volvox . The generated graph shows locus 3667, a gene for a serine threonine phosphatase. (A) Number of the corresponding genomic scaffold. (B) Nucleotide position within scaffold. (C) Cumulated graph with all splicing events at the given locus; the lengths of introns and exons are indicated. (D) Separate depiction of all identified splicing variants (here two variants). The longest open reading frame is shown in blue color; the length of the open reading frame is shown on the left side. (E) Depiction of all ESTs that were mapped to this genomic locus. The names of the ESTs (left side) are just as deposited in the GenBank EST database (http://www.ncbi.nlm.nih.gov/dbEST/). After genomic mapping of all available ESTs, we identified the alternatively spliced isoforms for each locus in Volvox, Chlamydomonas and Arabidopsis. Isoforms with alternative transcription starts or ends were not considered further in this paper, because we focus here on alternative splicing events. The alternatively spliced isoforms were divided into four major groups of events: exon skipping, intron retention, alternative 5′ and alternative 3′ splicing. In addition, there were instances of more complex splice forms, which were not covered by the above four simple alternative splicing events. To obtain splicing events with a high quality, we complement our predictions by a quality value to penalize the spurious events with poor EST support. The bioinformatic analysis identified 580 alternative splicing events in Volvox in a total of 426 genes. Thus, about 2.9% of all ~14,500 protein-coding Volvox genes are subject to alternative splicing. This percentage is more similar to the one observed in higher plants than to that in the closely related unicellular relative Chlamydomonas; considering the number of analyzed ESTs. The analysis of the different types of alternative splicing revealed that 9.5% of all alternative splicing events show exon skipping in Volvox, 46.5% show intron retention, 17.9% alternative 5′ splice sites and 21.9% alternative 3′ splice sites (Figure 2A). Thus, the predominant type of alternative splicing in Volvox is intron retention followed by alternative 3′ splice sites, alternative 5′ splice sites and exon skipping. Distribution of the different types of alternative splicing events. The percentage and total number (in parenthesis) of splicing events is shown for each type of alternative splicing, i.e., intron retention (IR), exon skipping (ES), alternative 5′ splice site (Alt5′) and alternative 3′ splice site (Alt3′). Asterisks (*) indicate the percentage of other, more complex alternative splicing types. The distribution is given for the species Volvox (A), Chlamydomonas (B), Arabidopsis (C) and human (D). The total number of alternative splicing events is 580 in Volvox, 493 in Chlamydomonas and 9,343 in Arabidopsis. In the closely related alga Chlamydomonas, the intron retention also is the most common type of alternative splicing (46%), followed by alternative 3′ splice sites (25.6%), alternative 5′ splice sites (13.4%) and exon skipping (11.2%) (Figure 2B). In Arabidopsis, the prevalence of different alternative splicing types shows the same distribution as in Volvox and Chlamydomonas, i.e. the percentage decreases in the following order: intron retention > alternative 3′ splice sites > alternative 5′ splice sites > exon skipping (Figure 2C). In contrast to non-plant model organisms like human (Figure 2D), exon skipping is the rarest simple form of alternative splicing in all of the three investigated species (Figures 2A-C). In Volvox, the majority of all alternative splicing events (66.7%) affect the coding regions. Another 33.3% occur within non-coding regions (14.8% in 5′ UTRs and 18.5% in 3′ UTRs) (Figure 3A). The results from Volvox were again compared with the genome and EST data of Chlamydomonas and Arabidopsis[31, 59], which were treated in the same way as the data from Volvox (see Methods). In Chlamydomonas, 10.8% of the alternative splicing events were detected in 5′ UTRs and 10.1% in 3′ UTRs (Figure 3B). In Arabidopsis, 12.8% of the alternative splicing events were localized in 5′ UTRs and 15.7% in 3′ UTRs (Figure 3C). In both organisms, the majority of alternative splicing events occur within the coding region, just as observed in Volvox. More precisely, it was 79.1% in Chlamydomonas and 71.5% in Arabidopsis (Figures 3B and 3C). Localization of alternative splicing events in the mRNAs. In the species Volvox (A), Chlamydomonas (B) and Arabidopsis (C) each mRNA was divided into coding region, 5′ UTR or 3′ UTR. The percentage and total number (in parenthesis) of splicing events is given for each of these mRNA regions. The splicing events totaled together 426 events in Volvox, 535 in Chlamydomonas and 8,742 in Arabidopsis. To validate the quality of both the used ESTs and our bioinformatic analysis, ten sample genes with identified alternative splicing events were selected for experimental verification by RT-PCR and quantitative real time RT-PCR (Additional file 1: Table S2). The decisive factor in the choice of a sample gene to be tested was the potential modification of protein domains or protein sequence motifs by alternative splicing. Strong EST support, however, was not relevant for our selection. As a consequence of this approach, for some of the selected sample genes, like the genes for the mitochondrial translation elongation factor Tu (efg8) and the selenocysteine-specific elongation factor (selEFf) , only one supporting EST for a given alternative splicing variant was available. By contrast, for other genes, like the gene for the oxygen evolving enhancer protein 1 (ooe1), more than one hundred ESTs existed (data not shown). The statistical evaluation of the data obtained from our bioinformatic analysis of alternative splicing indicates that splice variants of genes that show exon skipping lead more frequently to changes in protein properties (like protein localization and activity) than genes showing any other type of alternative splicing (data not shown). For that reason, the following seven sample genes with exon skipping and (putative) differences in the properties of the protein variants were selected: clpr2 (chloroplast Clp protease), efg8 (mitochondrial translation elongation factor Tu), hyd2 (iron hydrogenase), lsg2 (matrix metalloproteinase), mgmt (6-O-methylguanine DNA methyltransferase), nrnp1 (nuclear ribonucleoprotein) and selEFf (selenocysteine-specific elongation factor) (Figure 4 and Additional file 1: Table S2). Of particular interest was the experimental verification of the splicing products of efg8 and selEFf because of their uncommon gene structures with extremely long introns, which were 10772 bp (efg8) and 16365 bp (selEFf) in length (Figure 4). Gene structures and alternative splicing of ten sample genes. Two splice variants (V1 and V2) are shown for each gene. Grey boxes are exons and the carets represent introns. Arrow heads indicate the position of primers used for amplification of the respective alternative splicing variant (V1 or V2); primers used for amplification of both splice variants in one reaction tube are shown in the depiction of V1 (Additional file 1: Table S3). Dashed lines indicate that a primer spans an exon-exon junction; the exact position of the exon-exon boundary within such a primer is given in Additional file 1: Table S3. 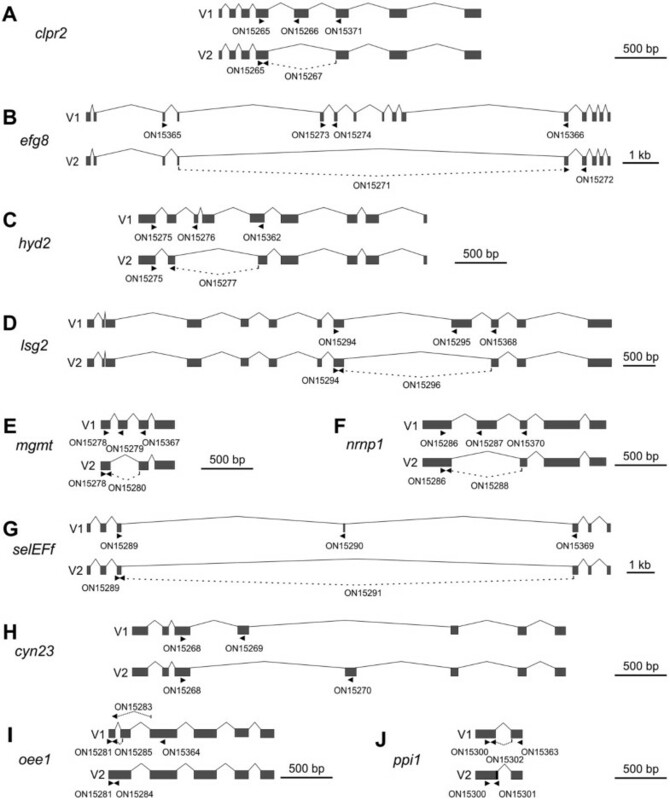 Genes that undergo exon skipping are clpr2 (A), efg8 (B), hyd2 (C), lsg2 (D), mgmt (E), nrnp1 (F) and selEFf (G). cyn23 (H) has mutually exclusive exons, oee1 (I) shows intron retention and ppi1 (J) uses alternative 5′ splice sites. In the second splice variant (V2) of ppi1, 21 bp at the 5′ side of the intron are retained (black area). In addition to exon skipping, we chose three further sample genes with other types of alternative splicing, which also lead to changes in protein properties. The selected genes were cyn23 (cyclophilin-type peptidyl-prolyl cis-trans isomerase), which shows alternative splicing via mutually exclusive exons, oee1 (oxygen evolving enhancer protein 1), which is an example for intron retention, and ppi1 (protein phosphatase inhibitor), which produces protein isoforms through alternative 5′ splice sites (Figure 4 and Additional file 1: Table S2). To allow for a distinction of the different splice variants of a given gene, we named the variants “first” and “second” splice variant. More precisely, the variant that shows an exon-intron structure identical or similar to a gene structure predicted as part of the Volvox genome project  or in a database entry (Additional file 1: Table S2) was called “first splice variant” and another splice variant was called “second splice variant”. The first of the seven sample genes with exon skipping was clpr2. This gene codes for a highly conserved, ATP-dependent serine protease , which shows 86% identity to Chlamydomonas CLPR2 in an overlap of 285 amino acid residues . Clp proteases are involved in many cellular and extracellular processes such as degradation of misfolded proteins, cell signaling and removing of short-lived regulatory proteins [69, 71]. The clpr2 gene of Volvox is 2,599 bp in length (from start to stop codon) and includes 8 exons and 7 introns (Figure 4A, Additional file 1: Table S2). In the second splice variant of clpr2, exon five that is 135 bp in length is excluded from the mRNA by exon skipping (Figure 4A). The first splice variant encodes a 284-residue polypeptide whereas the second splicing variant encodes a 239-residue polypeptide (Additional file 1: Figure S1A, Additional file 1: Table S2). The structure of the ClpP protein isoform encoded by the second splice variant probably differs from the reported protein structure of ClpP , which is encoded by the first splice variant (Additional file 1: Figure S1B). The conserved amino acid residues F100, N111, Y119 and L120, which are involved in the α/β-type fold of the protein , are lacking in the second protein variant of clpr2 (Additional file 1: Figure S1A). Both splice variants of clpr2 have been amplified by RT-PCR to confirm the results of the bioinformatic analysis. For it, total RNA was isolated from synchronously growing female Volvox cultures at the stage of hatching. Pairs of primers were established to amplify each splice variant separately. For amplification of the first splice variant of clpr2, one primer, ON15266, resides on exon 5, which is lacking in the mRNA of the second splice variant; the second primer is ON15265 on exon 4 (Figure 4A and Additional file 1: Table S3). For verification of the second splice variant, one primer, ON15267, only binds to the exon-exon junction of exons 4 and 6, which emerges only after removal of a 659 bp fragment between exon 4 and exon 6 by splicing; the second primer was ON15265 on exon 4 (Figure 4A and Additional file 1: Table S3). A 134-bp cDNA fragment was predicted for variant 1 and a 117-bp fragment for variant 2; the RT-PCR yielded fragments of the expected sizes (Figure 5A, Additional file 1: Table S3). It was also possible to amplify both variants in one and the same reaction using only a single pair of primers (ON15265 and ON15371, Figure 4A and in Additional file 1: Table S3). Fragments of 278 bp (variant 1) and 143 bp (variant 2) were expected and actually obtained in the RT-PCR (Figure 6 and Additional file 1: Table S3); it should be mentioned that in addition to the correct fragments, some non-specific side products were amplified (Figure 6). Subsequently, the relative expression levels of both splice variants were measured by quantitative real-time RT-PCR, which is a sensitive method for analyzing relative expression levels of alternative splicing variants [49, 73–75]. As a reference gene for the quantitative real-time RT-PCRs the actin gene was used. The actin gene already has been used in previous studies as a reference in RT-PCR and quantitative real-time RT-PCR expression analyses [49, 76–78]. The primer pairs ON15265/ON15266 and ON15265/ON15267 were used to amplify the first and the second splice variant separately. Both primer pairs did not produce any non-specific fragments during RT-PCR reactions and the fragment sizes were between 100 and 200 bp which is the optimal fragment size for quantitative real-time RT-PCR . The expression levels were calculated using the ∆∆Ct-method as described previously  and the results are shown in Figure 7A. The expression of the first splice variant of clpr2 is ~1.6 fold less than actin and ~35.8 fold higher than the expression of the second splice variant (Figure 7A). RT-PCR amplification of characteristic fragments of the different splice variants. The investigated sample genes with alternative splicing were clpr2 (A), efg8 (B), hyd2 (C), lsg2 (D), mgmt (E), nrnp1 (F), selEFf (G), cyn23 (H), oee1 (I) and ppi1 (J). Primers were designed to amplify a characteristic fragment of each alternative splicing variant specifically (Figure 4 and Additional file 1: Table S3). The amplicons of the first (V1) and second (V2) alternative splicing variants have been cloned and sequenced. The expected lengths of fragments are given in Additional file 1: Table S3. DNA fragments that are consistent with the predictions are marked by arrowheads. Single-tube RT-PCR amplification of different splice variants. 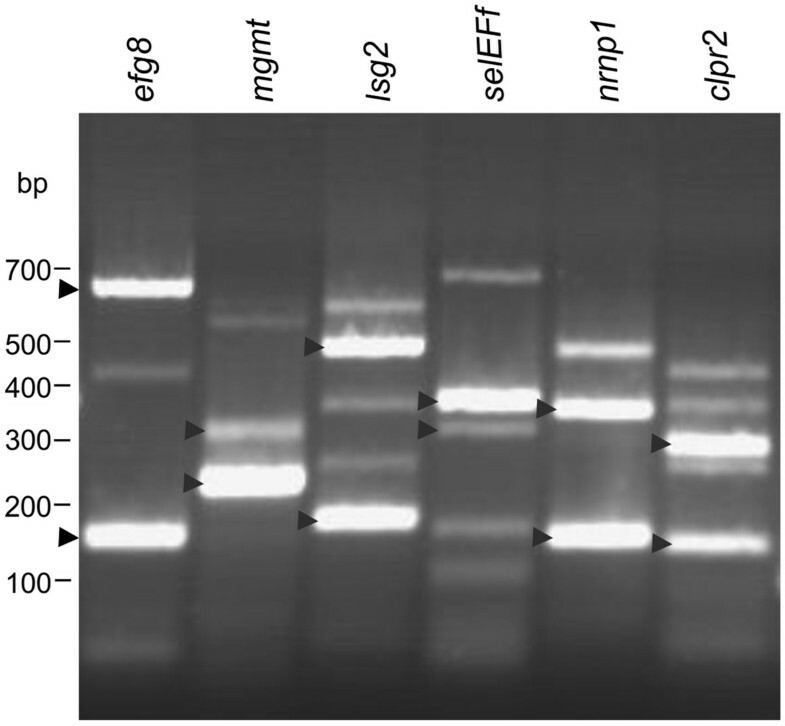 The investigated sample genes with alternative splicing were efg8, mgmt, lsg2, selEFf, nrnp1 and clpr2. Both splice variants of each gene were amplified in one and the same reaction using only a single pair of primers (Additional file 1: Table S3). The amplicons have been cloned and sequenced. The expected lengths of fragments are given in Additional file 1: Table S3. DNA fragments that are consistent with the predictions are marked by arrowheads. Quantitative expression analysis of alternative splicing variants by real-time RT-PCR. 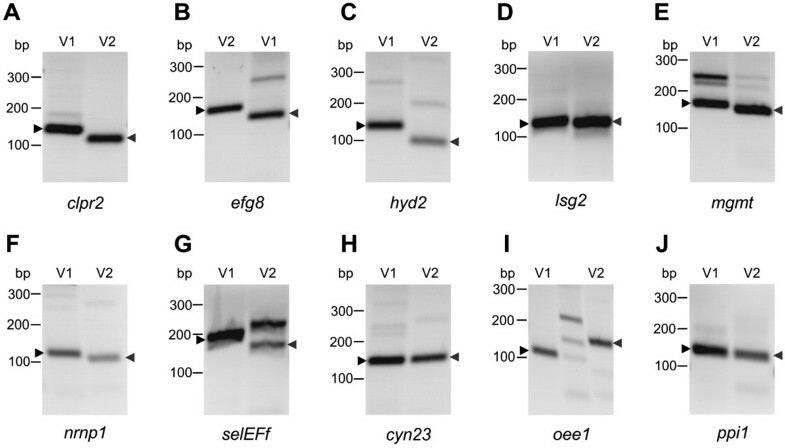 The investigated sample genes with alternative splicing were clpr2 (A), cyn23 (B), hyd2 (C), oee1 (D), lsg2 (E) and ppi1 (F). Primers were designed to amplify a characteristic fragment of each alternative splicing variant specifically (Figure 4 and Additional file 1: Table S3). On the left side of each panel, the expression levels of both alternative splicing variants are shown in relation to the actin gene (the expression level of actin was set as 100%). On the right side of each panel, the expression levels of both alternative splicing variants are compared against each other (the expression level of V1 was set as 100%). The second exon skipping candidate was efg8 (Figure 4B, Additional file 1: Table S2). This gene codes for the mitochondrial elongation factor EF-TU and it is localized at the mating type locus of Volvox. EF-TU elongation factors belong to the large family of GTP-binding elongation factors . The first splice variant of efg8 encodes a polypeptide of 453 amino acid residues, including three elongation factor domains, i.e. EF-TU, EFTU-II and EFTU-III (Additional file 1: Figures S2A-B). All three domains are essential for the elongation phase in protein synthesis . The first domain, EF-TU, is the catalytic domain, which is responsible for the binding to the guanine nucleotide . The non-catalytic domains II and III show a beta-barrel structure with six anti-parallel strands, which appear to be tightly associated to the catalytic domain [82, 83]. Interestingly, six exons are excluded in the second splice variant, which reduces the length of the mRNA by 510 nucleotides and the encoded polypeptide chain by 170 amino acid residues (Figure 4B, Additional file 1: Figure S2A). In the second variant, 139 amino acid residues of the catalytic EF-TU domain are lacking, which will in all likelihood affect the binding properties of the domain. Moreover, GTP-binding proteins usually have two conserved sequences with the consensus sequences Asn-Lys-x-Asp (residues 192 to 195 in the first variant) and Ser-Ala-Leu/Lys (residues 230 to 233 in the first variant), which are important for the binding to a guanine nucleotid ; both motives are lacking in the second variant (Additional file 1: Figure S2A). The first part of the EFTU-II domain also is absent in the second variant, which should cause altered binding properties and, thus, affect its activity in RNA translation [85, 86]. For amplification of the first splice variant of efg8 by RT-PCR, the primer ON15273 resides on exon 5 and primer ON15274 is located on exon 6; both exons are lacking in the mRNA of the second splice variant. For verification of the second splice variant, one primer, ON15271, only binds to the exon-exon junction of exons 4 and 11, which emerges only after removal of a large fragment (10772 bp) between exon 4 and exon 11 by splicing; the second primer was ON15272 on exon 12. A 151-bp cDNA fragment was predicted for variant 1 and a 176-bp fragment for variant 2; the RT-PCR yielded fragments of the expected sizes (Figure 5B, Additional file 1: Table S3). It was also possible to amplify both variants in one and the same reaction using only a single pair of primers (ON15365 and ON15366, Figure 4B and in Additional file 1: Table S3). Fragments of 664 bp (variant 1) and 154 bp (variant 2) were expected and actually obtained in the RT-PCR (Figure 6 and Additional file 1: Table S3). The relative expression levels of both splice variants of efg8 could not be determined by quantitative real-time RT-PCR because non-specific side products defeated the analysis repeatedly (the same was true for mgmt, nrnp1 and selEFf). The third sample gene was hyd2. This gene codes for an iron hydrogenase, which catalyzes the reversible conversion of molecular hydrogen to protons and electrons [87, 88] (Figure 4C, Additional file 1: Table S2). The first splice variant of hyd2 encodes a polypeptide with a large Fe-only hydrogenase domain, which is 352 amino acid residues long (residues 82 to 434). In the second splice variant, 169 amino acid residues are lacking at the N-terminal end of the polypeptide (Figure 4C, Additional file 1: Figure S3A), including 88 amino acid residues of the Fe-only hydrogenase domain [89, 90]. The X-ray crystal structure of the Fe-only hydrogenase from Clostridium pasteurianum could show that the amino acid residues 90 to 97 and 130 to 135 are essential to form β sheets around the active site  (Additional file 1: Figure S3A). Lack of this part in the second splice variant should change the protein structure and, as a consequence, the enzyme characteristics. In contrast, the actual active site is present in both variants of the Fe-only hydrogenase  (Additional file 1: Figure S3A). There are three conserved protein sequence motifs in the active site of variant 1, motif 1 (PMFTSCCPxW, residues 169 to 178), motif 2 (MPCxxKxxExxR, residues 228 to 239) and motif 3 (FxExMACxGxCV, residues 415 to 426), and variant 2 contains exactly the same motifs except for the very first amino acid residue of motif 1. For amplification of the first splice variant of hyd2 by RT-PCR, one primer, ON15276, resides on exon 3, which is lacking in the mRNA of the second splice variant; the second primer was ON15276 on exon 1 (Figure 4C and Additional file 1: Table S3). For verification of the second splice variant, one primer, ON15277, only binds to the exon-exon junction of exons 2 and 5, which emerges only after removal of a 818 bp fragment between exon 2 and exon 5 by splicing; the second primer was ON15275 on exon 1 (Figure 4C and Additional file 1: Table S3). A 128-bp cDNA fragment was predicted for variant 1 and a 102-bp fragment for variant 2; the RT-PCR yielded fragments of the expected sizes (Figure 5C, Additional file 1: Table S3); the band of variant 2 showed a lower intensity than the band of variant 1. It was not possible to amplify both variants of hyd2 in one and the same reaction, instead only one of both variants was amplified (the same was true for cyn23, oee1 and ppi1). However, the relative expression levels of both splice variants could be determined by quantitative real-time RT-PCR. The expression of the first splice variant of hyd2 is only ~1.5 fold higher than the expression of the second splice variant (Figure 7C). Compared to actin, both splice variants are expressed at a very low level, i.e. hyd2 variants 1 and 2 account for only 2.4% and 1.7%, respectively, of the actin expression level (Figure 7C). The fourth exon skipping candidate was lsg2. This Volvox gene codes for a matrix metalloproteinase; lsg2 was shown to be expressed with an above-average rate during the late developmental stages in somatic cells  (Additional file 1: Table S2). Lsg2 (variant 1) shows 31% identity to the gamete lytic enzyme (GLE) of Chlamydomonas in an overlap of 537 amino acid residues. GLE of Chlamydomonas is a proteinase, which degrades cell walls of gametes during mating . For enzymatic degradation, it contains a large peptidase M11 domain (amino acid residues 146 to 458 in variant 1, Additional file 1: Figure S4A) The M11 domain is conserved among several metalloproteinases including VMPs [94, 95]. The typical HExxHxxGxxH motif, which contains four histidine residues for zinc binding in the active site of the enzyme  can be found in variant 1 of Lsg2 (amino acid residues 301 to 312, Additional file 1: Figure S4A). Another motif, which is believed to be responsible for the binding to calcium, is also conserved in variant 1 of Lsg2 (amino acid residues 500 to 512, Additional file 1: Figure S4A). In contrast, 103 amino acid residues of the peptidase M11 domain are lacking in the polypeptide encoded by the second splice variant, because exon nine (309 bp) is excluded by exon skipping (Figure 4D, Additional file 1: Figure S4A). For amplification of the first splice variant of lsg2 by RT-PCR, one primer, ON15295, resides on exon 9, which is lacking in the mRNA of the second splice variant; the second primer was ON15294 on exon 8 (Figure 4D and Additional file 1: Table S3). For verification of the second splice variant, one primer, ON15296, only binds to the exon-exon junction of exons 8 and 10, which emerges only after removal of a 2285 bp fragment between exon 8 and exon 10 by splicing; the second primer was ON15294 on exon 8 (Figure 4D and Additional file 1: Table S3). A 137-bp cDNA fragment was predicted for variant 1 and a 131-bp fragment for variant 2; the RT-PCR yielded fragments of the expected sizes (Figure 5D, Additional file 1: Table S3). It was also possible to amplify both variants in one and the same reaction using only a single pair of primers (ON15294 and ON15368, Figure 4D and Additional file 1: Table S3). Fragments of 482 bp (variant 1) and 173 bp (variant 2) were expected and actually obtained in the RT-PCR (Figure 6 and Additional file 1: Table S3); it should be mentioned that in addition to the correct fragments, some non-specific side products were amplified (Figure 6). Quantitative real-time RT-PCR showed that both splice variants are expressed at a very low level in comparison to actin. However, the expression of the first splice variant of lsg2 is ~10 fold higher than the expression of the second splice variant (Figure 7E). The fifth sample gene was mgmt. This gene codes for a putative 6-O-methylguanine DNA methyltransferase (Additional file 1: Table S2). The O-6-methylguanine-DNA methyltransferase is essential for viability because it reverses DNA alkylation damage by removing the offending alkyl group [97–99]. The first splice variant of mgmt encodes a polypeptide with 153 amino acid residues in length (Additional file 1: Table S2, Additional file 1: Figure S5A) and contains a DNA binding domain, which is 89 amino acid residues long  (Additional file 1: Figure S5A,B). As a result of the exon skipping event, 29 residues are lacking in the DNA binding domain of the second variant (Figure 4E, Additional file 1: Figure S5A). Some of these 29 amino acid residues were previously shown to be involved in DNA binding . For example, the tyrosine residue at position 44 of variant 1 (Y44, Additional file 1: Figure S5A) has been shown to be a key residue involved in recognition of the O6-alkylguanine lesion through a hydrogen bond with the N3 atom of the modified base [101, 102]. Furthermore, the arginine residue at position 56 of variant 1 (R56, Additional file 1: Figure S5A) is necessary for the repair of base damage in duplex DNA . The absence of these two amino acid residues most probably affects the binding characteristics of the second protein variant. For amplification of the first splice variant of mgmt by RT-PCR, one primer, ON15279, resides on exon 2, which is lacking in the mRNA of the second splice variant; the second primer was ON15278 on exon 1 (Figure 4E and Additional file 1: Table S3). For verification of the second splice variant, one primer, ON15280, only binds to the exon-exon junction of exons 1 and 3, which emerges only after removal of a 276 bp fragment between exon 1 and exon 3 by splicing; the second primer was ON15278 on exon 1 (Figure 4E and Additional file 1: Table S3). A 173-bp cDNA fragment was predicted for variant 1 and a 165-bp fragment for variant 2; the RT-PCR yielded fragments of the expected sizes (Figure 5E, Additional file 1: Table S3); in the PCR of variant 1 also two larger, non-specific side products were amplified, as verified by cloning and sequencing. It was also possible to amplify both variants in one and the same reaction using only a single pair of primers (ON15278 and ON15367, Figure 4E and Additional file 1: Table S3). Fragments of 310 bp (variant 1) and 223 bp (variant 2) were expected and actually obtained in the RT-PCR (Figure 6 and Additional file 1: Table S3); it should be mentioned that in addition to the correct fragments, a larger, non-specific side product was amplified (Figure 6). The sixth exon skipping candidate was nrnp1. This Volvox gene codes for a polypeptide with two RNA recognition motif (RRM) domains, also known as RNA binding domains (RBDs). The RRM domain is by far the most abundant type of eukaryotic RNA-binding motif. This domain is involved in different cellular processes like mRNA and rRNA processing, RNA export and RNA stability [103–105]. The first splice variant of nrnp1 encodes a polypeptide with 344 amino acid residues; the RRMs are localized at amino acid residues 76 to 132 and 150 to 219 (Additional file 1: Table S2, Additional file 1: Figure S6A). The protein product of the second splice variant is 179 amino acid residues shorter than the first variant (Figure 4F and Additional file 1: Figure S6). In the second variant, the first RRM domain is lacking and the second RRM domain is truncated, i.e., 29 amino acid residues are lacking (Additional file 1: Figure S6A). The crystal structure analysis of the RRM domain previously showed that the first part of the domain is important for correct folding . The complete elimination of the first RRM and the truncation of the second RRM domain most probably change the RNA binding capacity significantly in the second variant. For amplification of the first splice variant of nrnp1 by RT-PCR, one primer, ON15287, resides on exon 2, which is lacking in the mRNA of the second splice variant; the second primer was ON15286 on exon 1 (Figure 4F and Additional file 1: Table S3). For verification of the second splice variant, one primer, ON15288, only binds to the exon-exon junction of exons 1 and 3, which emerges only after removal of a 542 bp fragment between exon 1 and exon 3 by splicing; the second primer was ON15286 on exon 1 (Figure 4F and Additional file 1: Table S3). A 116-bp cDNA fragment was predicted for variant 1 and a 107-bp fragment for variant 2; the RT-PCR yielded fragments of the expected sizes (Figure 5F, Additional file 1: Table S3). It was also possible to amplify both variants in one and the same reaction using only a single pair of primers (ON15286 and ON15370, Figure 4F and Additional file 1: Table S3). Fragments of 342 bp (variant 1) and 152 bp (variant 2) were expected and actually obtained in the RT-PCR (Figure 6 and Additional file 1: Table S3); it should be mentioned that in addition to the correct fragments, a larger, non-specific side product was amplified (Figure 6). The seventh and last exon skipping candidate was selEFf, which is localized at the mating type locus of Volvox (Additional file 1: Table S2). This gene codes for a putative selenocysteine-specific elongation factor (selEFf). Such translation factors are necessary for the incorporation of selenocysteine into proteins; selEFfs probably replace EF-Tu for the insertion of selenocysteine directed by the UGA codon . In the first splice variant of selEFf, a very short exon (exon 4, 56 bp) is flanked by two very large introns, 7,996 bp and 8,313 bp in length (Figure 4G). This exon is excluded from the second splice variant by exon skipping and thus, an intron of 16,365 bp is spliced out. This intron seems to be the largest intron reported so far in Volvox. The alternative splicing event in the second variant also introduces a premature stop codon into the open reading frame (Additional file 1: Figure S7A). Unfortunately, no information about the structure of selEFf proteins is available, but the elimination of 142 amino acid residues in the second splice variant means that the length of the polypeptide is almost halved relative to the first variant and this significant cut-off probably affects the structure and characteristics of this translation factor. For amplification of the first splice variant of selEFf by RT-PCR, one primer, ON15290, resides on exon 4, which is lacking in the mRNA of the second splice variant; the second primer was ON15289 on exon 3 (Figure 4G and Additional file 1: Table S3). For verification of the second splice variant, one primer, ON15291, only binds to the exon-exon junction of exons 3 and 5, which emerges only after removal of a 16365 bp fragment between exon 3 and exon 5 by splicing; the second primer was ON15289 on exon 3 (Figure 4G and Additional file 1: Table S3). A 196-bp cDNA fragment was predicted for variant 1 and a 166-bp fragment for variant 2; the RT-PCR yielded fragments of the expected sizes (Figure 5G, Additional file 1: Table S3); in addition to the correct fragments, a larger, non-specific side product was amplified in the RT-PCR for the second variant. It was also possible to amplify both variants in one and the same reaction using only a single pair of primers (ON15289 and ON15369, Figure 4G and Additional file 1: Table S3). Fragments of 357 bp (variant 1) and 301 bp (variant 2) were expected and actually obtained in the RT-PCR (Figure 6 and Additional file 1: Table S3); in addition to the correct fragments, some non-specific side products were amplified (Figure 6). The sample gene for mutually exclusive exons was cyn23, which encodes a cyclophilin-related protein (Additional file 1: Table S2). Cyclophilins are ubiquitous proteins that belong to the family of peptidyl-prolyl cis/trans isomerases (PPIases) , also known as immunophilins. These immunophilins are proposed to function in protein folding, protein degradation, stress response, signal transduction and pre-mRNA splicing [109–113]. The cyn23 gene contains two alternate mutually exclusive exons, exons 4 and 5. Because both exons are 106 nucleotides in length (Figure 4H, Additional file 1: Figure S11), the number of amino acid residues of the two protein isoforms is identical. However, the two isoforms differ from each other at 13 amino acid positions: A125G, G127Y, G128D, N129D, K130P, G132S, A133G, R134A, V139I, E150Q, A152T, I153A and G155A (Additional file 1: Figure S8A). Some of these residues, like alanine at position 125, have been reported to be part of the cyclosporin-binding site [114, 115]. Moreover, exchange of amino acids between positions 116 and 155 by site-directed mutagenesis was shown to affect the binding properties of cyclophilins [116, 117]. Therefore, the differences in amino acid sequence between the two isoforms might produce isoforms with different binding properties. For amplification of the first splice variant of cyn23 by RT-PCR, one primer, ON15269, resides on exon 4 and the second primer is ON15268 on exon 3 (Figure 4H and Additional file 1: Table S3). For verification of the second splice variant, one primer, ON15270, resides on exon 5 and the second primer again was ON15268 on exon 3. A 145-bp cDNA fragment was predicted for variant 1 and a 146-bp fragment for variant 2; the RT-PCR yielded fragments of the expected sizes (Figure 5H, Additional file 1: Table S3). Due to the almost identical fragment sizes and the resulting identical migration distances in the gel, both variants were not amplified in one and the same reaction. Quantitative real-time RT-PCR showed that both splice variants are expressed at a very low level in comparison to actin. However, the expression of the first splice variant of cyn23 is ~2.8 fold higher than the expression of the second splice variant (Figure 7B). The candidate gene for verification of intron retention was oee1, which codes for a subunit of the oxygen evolving complex of photosystem II (Additional file 1: Table S2). Previously, it was demonstrated that oee1 is subject to germline-specific expression in Volvox[118, 119]. The first splice variant of oee1 encodes a polypeptide of 297 amino acid residues (Additional file 1: Figure S9A, Additional file 1: Table S2), which shows 87% identity to OEE1 of Chlamydomonas in an overlap of 294 amino acid residues . It includes a large manganese-stabilizing protein (MSP) domain (Additional file 1: Figure S9A, B), which is required for photosystem II assembly, stability and photoautotrophy . In the second splice variant of oee1, the first intron (69 bp in length) is retained by alternative intron retention (Figure 4I), which potentially leads to an N-terminally truncated protein isoform with a shortened MPS domain (Additional file 1: Figure S9A,B). For verification of the first splice variant of oee1 by RT-PCR, one primer, ON15285, only binds to the exon-exon junction of exons 1 and 2, which emerges only after removal of intron 1 (69 bp) by splicing; the second primer was ON15281 on exon 1 (Figure 4I and Additional file 1: Table S3). For amplification of the second splice variant, one primer, ON15284, resides on the retained intron sequence (intron 1 of variant 1), which therefore is lacking in the mRNA of the first splice variant; the second primer was ON15281 on exon 1 (Figure 4I and Additional file 1: Table S3). A 111-bp cDNA fragment was predicted for variant 1 and a 158-bp fragment for variant 2; the RT-PCR yielded fragments of the expected sizes (Figure 5I, Additional file 1: Table S3). Quantitative real-time RT-PCR showed that the expression of the first splice variant of oee1 is ~17 fold higher than actin; whereas the expression of the second variant is ~11 fold less than actin (Figure 7D). The bioinformatic analysis of EST sequences revealed a third splice variant of ooe1. For verification of this variant by RT-PCR, one primer, ON15283, only binds to the exon-exon junction of exons 1 and 3, which emerges only after removal of a 356 bp fragment between exon 1 and exon 3 by splicing; the second primer was ON15281 on exon 1 (Figure 4I and Additional file 1: Table S3). A 112-bp cDNA fragment was predicted for variant 3. However, we were not able to confirm this variant by RT-PCR (Figure 5I, middle lane). The sample gene for alternative 5′ splice sites was ppi1, which codes for a protein with an Ypi1 domain (Additional file 1: Table S2). The Ypi1 domain is a Saccharomyces cerevisiae type 1 protein phosphatase inhibitor . The gene ppi1 of Volvox is a quite small gene with a single intron, which is 100 bp in length. The first splice variant of ppi1 encodes a 100-amino-acid polypeptide, which shows 82% identity to the FAP255 protein of Chlamydomonas. FAP255 is a flagellar associated protein found in the flagellar proteome [59, 123] (Additional file 1: Table S2, Additional file 1: Figure S10A). In the second splice variant, 21 bp at the 5′ side of the intron are retained and thereby a premature stop codon is introduced (Figure 4J). As a consequence, a shortened protein isoform with a truncated Ypi1 domain is produced (Additional file 1: Figure S10B). For verification of the first splice variant of ppi1 by RT-PCR, one primer, ON15302, only binds to the exon-exon junction of exons 1 and 2, which emerges only after complete removal of the 100 bp of intron 1 by splicing; the second primer is ON15300 on exon 1 (Figure 4J and Additional file 1: Table S3). For amplification of the second splice variant, one primer, ON15301, resides on the retained 21 bp of intron 1, which therefore is lacking in the mRNA of the first splice variant; the second primer was ON15300 on exon 1 (Figure 4J and Additional file 1: Table S3). A 140-bp cDNA fragment was predicted for variant 1 and a 141-bp fragment for variant 2; the RT-PCR yielded fragments of the expected sizes (Figure 5J, Additional file 1: Table S3); the band of variant 2 showed a lower intensity than the band of variant 1. Quantitative real-time RT-PCR showed that the expression of the first splice variant of ppi1 is ~70% higher than the expression of actin and even ~1000% higher than the expression of variant 2. This work provides a bioinformatic analysis of 132,038 ESTs in relation to alternative splicing events in the multicellular green alga Volvox. The results show that 66.7% of the alternative splice events are within the coding region (Figure 3A) and thus have an effect on the protein sequence and, as a consequence, frequently also on protein structure and function. The remaining 33.3% of all alternative splice events in Volvox were within the 5′ and 3′ UTRs (Figure 3A), which is higher than reported data (21-28.5%) from Arabidopsis (Figure 3C), mouse and human [5, 124–127] and this study). Thus, UTRs in the alga Volvox are more frequently target of alternative splicing than UTRs in the land plant Arabidopsis (Figures 3A and 3C). Alternative splicing of UTRs can play a key role both in regulation and in the production of mRNA diversity [11, 128]. Moreover, changes in mRNA secondary structure can affect RNA processing, mRNA stability and translation of the messenger [129–131]. In addition, it possibly creates phenotypic variability . In multicellular organisms, regulation of mRNA stability plays a crucial role in development, growth and differentiation . That data indicate that there might be more variability and diversity through alternative splicing in Volvox UTRs than in Arabidopsis UTRs (Table 1, Figures 3A and 3C). 1 this study, 2, 3,4[16, 134]. *4.2% show other alternative splicing events. **0.7% show both alternative 5′ splice site and alternative 3′ splice sites. *** 32.7 % show other alternative splicing events such as exclusive exon, alternative first exon, alternative last exon and tandem 3′ UTR. The distribution scheme of the different types of alternative splicing in Volvox shows that intron retention is the predominant type, while exon skipping is only a smaller part (46.5% versus 9.5%; Table 1, Figure 2A). Interestingly, the situation in human is just opposite to the situation in Volvox: there are only 1% intron retention events and 35.6% exon skipping events (Table 1). These highly differing distributions could result from different genome features. For example, the introns in human are much longer than in Volvox, or to be more exact, the median sizes of introns are 1,504 bp versus 358 bp [58, 135]. The size of introns is crucial factor in the mechanism of intron retention, i.e., short introns were shown to be much more frequently retained than longer introns [136–138]. On the contrary, an increase in intron length correlates positively with promotion of the exon skipping mechanism [65, 139, 140]. Therefore, intron length is the determining factor for the switch from the intron definition mechanism, in which the 5′ and 3′ splice sites are initially recognized and paired across the intron, to the exon definition mechanism, in which splice sites are paired first across the exons, with spliceosome assembly proceeding through subsequent pairing of exon units . Thus, a plethora of short introns is Volvox is probably recognized and spliced out through the intron definition mechanism, while in human the exon definition mechanism is dominant because a vast number of exons is flanked by long introns [140, 141]. It should be noted that the introns of Chlamydomonas are even somewhat (~25%) shorter than those in Volvox, i.e., the average lengths are 491 bp and 373 bp, respectively (Additional file 1: Table S1), but the calculated intron retention rate is about the same in both organisms (Figure 2, Table 1). However, the intron lengths of both species can be considered as short and therefore the intron definition mechanism seems to apply for both species to the same extend. Our analysis of ESTs in Volvox revealed that 2.9% of all Volvox genes undergo alternative splicing, which is similar to the reported 3% for Chlamydomonas. The absolute numbers of alternative splicing events were 580 for Volvox and 493 for Chlamydomonas (Figure 2). However, it should be noted that the absolute numbers and percentages have been calculated based on different total EST numbers, i.e., the number of analyzed ESTs in Chlamydomonas (252,484) was almost twice that of Volvox (132,038) (Table 1) even if the total number of protein-coding loci is about the same in Volvox (14,520) and Chlamydomonas (14,516) . Because the total number of ESTs is a critical value for detection of alternative splicing events, probably more alternative splicing events remained undetected in Volvox than in Chlamydomonas. These results and considerations indicate that actually the rate of alternatively spliced genes is higher in Volvox than in Chlamydomonas and, thus, also the variability and diversity through alternative splicing appears to be higher in Volvox. However, the data presented here are not corrected for the amount of transcript evidence available. The number of ESTs analyzed in Volvox (132,038) is similar to the number of ESTs analyzed in Arabidopsis (176,915) in a study by Zhu et al. in 2003 , which came to a value of 1.5% alternatively spliced genes for Arabidopsis (Additional file 1: Figure S12). As mentioned above, nine years later, after sequencing countless more ESTs, the rate was calculated to be 61% [18, 19]. Therefore, in actual fact, alternative splicing in the alga Volvox might be just as common as in higher eukaryotes like Arabidopsis, Drosophila or even human [13, 17][14–16, 19]. During our genome-wide analysis, we found some genes with remarkable alternative splicing variants regarding the size or number of excluded introns and exons. One of these genes is efg8, which is subject to exon skipping (Figure 4B). The first splicing variant of efg8 contains 15 exons. In the second splicing variant even six consecutive exons (5 to 10) are skipped at once. These exons are quite short, i.e., between 44 and 121 bp in size, and also the sequences between the exons are short (between 162 and 718 bp). However, two extremely long introns flank the skipped sequence: The introns 4 (between exon 4 and 5) and 10 (between exon 10 and 11) are 3,958 and 4,407 bp in length, respectively (Figure 4B). Thus, in the second splicing variant an intron of 10,772 bp is spliced out, which contains exons 5-10 and introns 4-11. This spliced fragment of the second variant is one of the longest introns identified in Volvox so far (Figure 4B). In Arabidopsis and maize, the longest reported introns are about 3 and 7 kb in length, respectively [142–144]. The longest introns among all plants have been identified in tobacco and rice, which are about 17 and 28 kb in length, respectively [145, 146]. In general, especially long introns can contain regulatory elements to control gene expression under certain conditions (development, cell-type specificity, environmental influences) [147, 148]. The selEFf gene is also subject to exon skipping. The first splicing variant of selEFf contains 7 exons. In the second splicing variant a single small exon (exon 4), only 56 bp in length, is skipped. This exon is flanked by two extremely long introns, which are 7,996 and 8,313 bp in length, respectively (Figure 4G). Thus, in the second splicing variant an intron of 16,365 bp is spliced out (Figure 4G), which contains exon 4, intron 3 and intron 4. This spliced ~16 kb fragment of the second variant is one of the longest introns identified in the plant lineage so far; it is longer than any intron in Arabidopsis or maize. Alternative splicing is a major mechanism for generating proteome diversity, which probably was co-opted in evolution of multicellular complexity ; it plays a critical role in differentiation and development of multicellular eukaryotes [128, 150]. Because Volvox only has about the same number of protein-coding genes compared to its unicellular relative Chlamydomonas, alternative splicing could have contributed to an increase in proteome diversity when a unicellular Chlamydomonas-like ancestor evolved to the multicellular Volvox alga with its differentiated cells. In more concrete terms, the transition to multicellularity in volvocine algae required a proteome with an increased capacity to address new traits and tasks like multicellularity, cell differentiation, multicellular motility and phototaxis as well as egg and sperm formation. Alternative splicing seems to be particularly important for the generation of new or modified regulatory proteins, which are indispensable in the evolution of multicellular complexity . Especially transcription factors and signal transducers that act as key regulators in complex, multicellular systems seem to be subject to extensive alternative splicing [124, 125, 151]. In our analysis we found some evidence that alternative splicing actually affects key regulators. For example, the retinoblastoma gene rbr1/mat3, which codes for a key cell cycle and cell size regulator [49, 152], is only subject to alternative splicing in the multicellular alga Volvox; no such event has been reported its close unicellular relative Chlamydomonas[49, 50, 152]. This gene also shows gender-specific splicing in Volvox and it is believed to be involved by the evolution of oogamy [50, 153]. Also worth mentioning is the general distribution of alternatively spliced genes in Volvox in relation to its unicellular relative Chlamydomonas. For it, we took one-hundred alternatively spliced genes from Volvox and compared them with the corresponding orthologs in Chlamydomonas. Ten of these one-hundred genes were those that were selected for experimental verification and another ninety alternatively spliced genes were randomly selected. The results are shown in Figure 8 and Additional file 1: Table S4. The comparison demonstrates that the largest fraction of alternatively spliced genes in Volvox (70% of the analyzed genes) does not exhibit alternative splicing in the unicellular alga Chlamydomonas. The lack of alternative splicing events for those genes in Chlamydomonas is not due to poor EST support, because the total number of ESTs is lower for the Volvox genes than for their orthologs in Chlamydomonas (Figure 8 and Additional file 1: Table S4). This observation supports the idea that alternative splicing events increased during evolution from the unicellular ancestor to the multicellular alga Volvox in order to expand the transcript diversity and, as a consequence, the proteomic diversity. Recently, the group of Urrutia also demonstrated a strong association between alternative splicing and organism complexity . In addition to alternative splicing, gene duplication followed by divergence also increases proteome diversity . During evolution of multicellular volvocine algae, the number of members in several protein families increased significantly through gene duplication. The families with the most extensive expansions are the VMPs, the pherophorins and the cyclin Ds, which are involved in the (partly gender-specific) biosynthesis of the extracellular matrix and in the regulation of cell division program during development . Alternative splicing status of orthologous gene pairs of Volvox and its closely related, unicellular relative Chlamydomonas . Comparison of the ten investigated sample genes of Volvox with their orthologs in Chlamydomonas regarding alternative splicing events. A green background shows genes with alternative splice events, a red background indicates that genes do not exhibit alternative splicing. Numbers indicate the EST coverage of given genes in Volvox (V.c.) or Chlamydomonas (C.r.). However, in contrast to the extent of gene duplications, which remains invariant after sequencing of the genome, it can be expected that the percentage of alternatively spliced genes will increase strongly in Volvox when more and more EST data and full-length cDNA sequences become available, just as it happened earlier in Arabidopsis[18, 19, 22–24, 154]. In all probability, deep sequencing of the Volvox transcriptome during asexual and sexual development, during embryonic cleavage divisions and cellular differentiation and under various environmental conditions (e.g., heat and light stress or nutrient deprivation) will yield numerous new splicing variants. Thus, it is becoming increasingly clear that alternative splicing is not an exception, but relatively widespread in Volvox and other eukaryotes. This degree raises quite difficult questions: Do all splice isoforms have functional significance? How big is the noise in the splicing process? At which extent do truncated and misfolded proteins play a role in cellular regulation? Which amount of inadvertently produced isoforms can be tolerated by a cell? However, frequently alternative splicing seems to be part of molecular mechanisms that allow (some) cells of an organism to decrease the concentration of certain (functional) proteins without changing the transcription rate of the corresponding genes. Instead, shortened or modified non-functional mRNA variants are generated by alternative splicing. In this way, specific cellular and physiological processes can be attenuated, altered or even intensified at the post-transcriptional level. In human, splicing error rates of 1 to 10 percent have been calculated [155, 156], but it remains difficult to distinguish between functional and non-functional isoforms because also truncated proteins might have a function. In several studies, criteria like abundance, conservation of splicing events across species, tissue specificity and developmental stage specificity have been used to assess functionality [155, 157]. Different models proceed on the assumption that the splicing machinery makes mistakes at a constant error rate, is dependent on the number of introns or is determined by the number of introns and transcript abundance [155, 157]. However, the noise in the splicing process should not be considered as a collateral damage of splicing. Noise in splicing might have been an important factor in the evolution of multicellularity in volvocine algae because it creates a landscape of opportunities in which novel biological activity can be explored at very little cost . Our results show that the approach for prediction of alternative splicing events in Volvox was accurate and reliable. Moreover, quantitative real-time RT-PCR appears to be useful for analyses of relationships between the appearance of specific alternative splicing variants and different kinds of physiological, metabolic and developmental processes as well as responses to environmental changes. Synchronous cultures of Volvox carteri f. nagariensis strain EVE (wild-type female)  were grown in standard Volvox medium  at 28°C in an 8 h dark/16 h light (10,000 lux) cycle . Genomic sequences of Volvox carteri f. nagariensis (strain Eve) came from the Volvox carteri whole genome shotgun sequencing project  (GenBank project accession No. ACJH00000000). The genomic contigs of Volvox are available both on the web pages of phytozome (v10), the plant comparative genomics portal of the Department of Energy’s Joint Genome Institute (JGI) (http://www.phytozome.net/), and on the web pages of the Volvox genome portal of JGI (http://genome.jgi-psf.org/Volca1/Volca1.info.html). The sequences of 132,038 ESTs of Volvox carteri f. nagariensis were generated as part of the Volvox genome project  and are available at the GenBank EST database (http://www.ncbi.nlm.nih.gov/dbEST/) and at the PlantGDB web resource (http://www.plantgdb.org/). These ESTs were derived from the female Volvox carteri f. nagariensis strains Eve and Eve10 and the male strain 69-1b . RNAs from Eve and 69-1b were isolated 1.5, 10, 24, 48 hours after sexual-induction and subsequently pooled. For Eve10, extracted RNAs from 2-4 and 32-128 cell stages were pooled. The sequences both of genomic contigs and ESTs of Chlamydomonas came from the Chlamydomonas whole genome shotgun sequencing project . The data are available both on the web pages of phytozome (v10) and at the PlantGDB web resource. The genomic and EST sequences of Arabidopsis came from the Arabidopsis Genome Initiative (AGI) . The data are available both on the web pages of The Arabidopsis Information Resource (TAIR) (http://www.arabidopsis.org/) and at the PlantGDB web resource. The ESTs of the three species Volvox, Chlamydomonas and Arabidopsis were aligned to the corresponding genomic contigs and genome sequences using BLAT, a BLAST-like alignment tool . To avoid double counting of paralogs, we only used the best alignment. Sequences with less than 95% identity were removed from further analysis. The resulting alignments were then clustered by genomic location where each cluster is formed by the set of all ESTs which overlap at a given location. The splice site consensus sequences (GT/AG) were identified and sequences without splice site consensus sequence were also removed. Subsequently, an alternative splicing graph of potential splice variants was constructed. An intron in the splice graph was constructed when there was EST evidence of a transcript with appropriate splice sites. From the splice graphs, we identified alternatively spliced isoforms. Isoforms with alternative transcription starts or ends were not considered further in this paper. The isoforms were divided into four major groups of alternative splicing events: exon skipping, intron retention, alternative 5′ and alternative 3′ splicing. This was obtained by searching for patterns of exons and introns that are consistent with these events. In addition, there were instances of more complex splice forms, which were not covered by the above four simple alternative splicing events. To obtain high quality events, only events were included where the amount of sequence evidence for both splice alternatives was within ten times of each other. This was to exclude spurious events due to a small number of ESTs. For verification of alternative splicing events, primers were designed such that they have similar melting temperatures, allowing both primers to anneal roughly at the same temperature in RT-PCR and real-time RT-PCR experiments. For each candidate gene, three pairs of primers were chosen to amplify the first and the second splice variant separately and also both splice variants together in one reaction tube (Figure 4 and Additional file 1: Table S3). The primers were designed using the primer analysis software Oligo 6 (Molecular Biology Insights, Cascade, CO), DNASIS (version 7.00; Hitachi Software Engineering, South San Francisco, CA), or Primer Express (Applied Biosystems, Foster City, CA). Total RNA was extracted from 1 g frozen algae using 10 ml of the phenol-based TRI Reagent (Sigma-Aldrich, St. Louis, MO) and 3 ml trichloromethane. RNA was precipitated from the aqueous phase by addition of isopropanol. All preparation and handling steps of RNA took place under RNase-free conditions. After final washing steps with ethanol, RNA was dissolved in RNase-free water and stored at -70°C until used. RNA quantity and purity were determined by measuring the 260/280 ratio using an UV/visible spectrophotometer (Ultrospec 2100 pro, GE Healthcare, Uppsala, Sweden). The quality of RNA was verified by electrophoresis of 0.5 μg RNA in a 1.3% agarose-formaldehyde gel. 1 μg of extracted total RNA was treated with 5 units of DNase I (Promega, Madison, WI) for 15 min at room temperature and then DNase I was inactivated at 75°C for 10 min. 1 unit of M-MLV Reverse Transcriptase (Promega, Madison, WI) and 1 μM of reverse primer were added for synthesis of the first strand cDNA at 50°C for 60 min (Figure 4, Additional file 1: Table S1). The synthesized cDNA was used as a template for PCR according to standard protocols . Quantitative real-time RT-PCR was performed on a DNA Engine Opticon Continuous Fluorescence Detection System (MJ Research) using the SensiMix one-step kit (Quantace) as described previously . 300 ng total RNA was used per 25 μl of reaction volume. The thermal cycling conditions were identical for all quantification experiments, i.e. after the first cDNA synthesis at 50°C for 30 min, DNA polymerase was activated at 95°C for 10 min, followed by 40 cycles of denaturation at 95°C for 20 s, annealing at 55°C for 30 s and extension at 72°C for 40 s. The expression levels of splice variants were calculated in relation to a reference gene, the housekeeping gene actin[76, 78, 162], using the 2-ΔΔCt method [163, 164]. The Ct, ∆Ct, and ∆∆Ct values were calculated as described previously . All real-time RT-PCR experiments were carried out in triplicate together with controls lacking RT or template. The final products of all real-time RT-PCR reactions were visualized using agarose gel electrophoresis to ensure amplification of a single product of the correct size. We thank Stefanie Heinze and Kordula Puls for technical assistance and Ghazaleh Nematollahi for her assistance with the data analysis of alternative splicing events. We acknowledge the support of the Deutsche Forschungsgemeinschaft (DFG) and the Open Access Publication Funds of Bielefeld University, which funded the article processing charges. AK was supported by DFG grant KI 1779/1-1. AK conducted the molecular biological experiments and wrote the first version of the manuscript. CSO and GR did the bioinformatic analysis. AH critically evaluated the data and finalized the manuscript. All authors read and approved the final manuscript.